It’s been a week & a half. I love my new job as a mom. Ask anyone close to me, and you’ll know that I had so many reservations about becoming a parent. I know we still have a long way to go, but these first few days with Wes have been wonderful. Both dogs have thrown up at least twice due to eating weeds in the backyard. Rain finally wet the ground for 20 minutes after a week-long record heat wave. It was just enough to fill our rain barrel, but nothing more. Mad Men starts streaming on Netflix today, and it’s super perfect timing. I’m geeked-out excited to start the series, since we are old school and don’t have cable. Peed on his namesake, Matt. Developed a major appetite and is now back up to his birth weight (maybe more!). Allowed us to sleep an average of 4 consecutive hours a night. Smiled in his sleep. He has a single dimple on his left cheek – adorable. Slept through all but one of his 45 visitors thus far. Sorry, Jared, for the fussiness! Changed all but 3 of Wes’ diapers. Tidied the house all day, every day. Went back to work today. Discovered & fell in love with witch hazel and lanolin. Dropped 25 of the 45 lbs gained! Successfully accomplished first outing to Target without baby. No meltdown. Successfully took a shower & shaved legs without daddy around. No freak out. 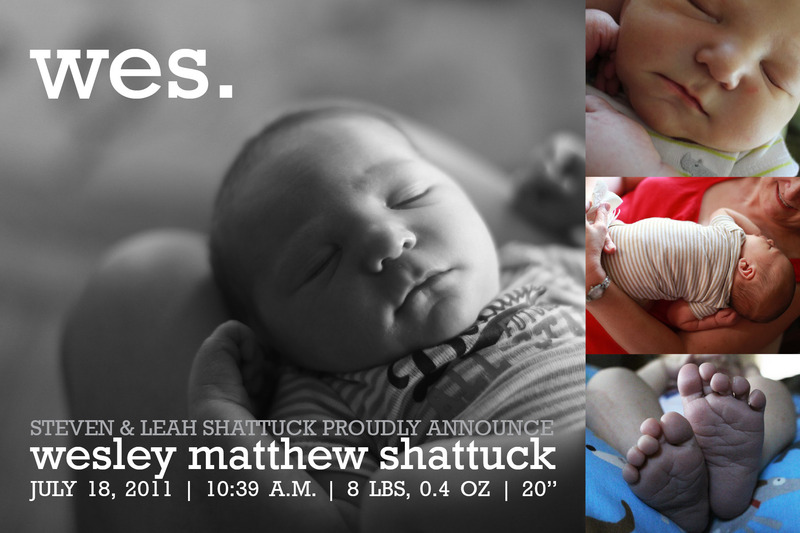 Finished birth announcement. To save money, I just designed it as a 6×4 piece and got a super sweet deal on SnapFish – 100 prints for $1! Score. Enjoyed all the support and visits with friends & family. And food gifts. Felt the prayers from around the world. (There is a congregation in India praying for us!) I have never felt so at-ease, comforted and loved. God definitely has a marvelous plan and a supporting hand on our backs. It’s been a week I’ll remember forever. I love this little boy more every day. His new discoveries are thrilling to watch, and I’m looking forward to several more weeks of constant time with GrumpFace before entering a new era of juggling work with family life. Will I be ready to go back to work? Will I dread it? I’m glad that’s a few weeks away and I don’t really have to think about it yet. For now, I’m loving snuggle time with little Wesley Matthew. Beware, this is likely to be a rather winded post. End disclaimer. Waiting for Wesley to arrive was a little difficult, only because I was so far progressed. If you read past posts, you knew that I was 4 cm dilated and 80% effaced at my 40-week appointment. Doc was convinced I was delivering over the weekend, but we scheduled an induction for Monday morning if that didn’t happen. To pass the time, we went to see Harry Potter 7.2 the day after D Day (thank you, Wes! That shows your love for me.) and walked around the mall and downtown to encourage his arrival. That evening, I started having mild but regular contractions that lasted all night long, preventing me from sleeping much at all. Waking up on Saturday morning, they had completely stopped. Not fair. Disappointed and hot, we just stayed in on Saturday, thinking that labor was imminent. I had a similar night with regular contractions to keep me up, only to have them stop Sunday morning. I was so tired and bummed that we just skipped church and watched bad TV all day. After dinner and ice cream with my parents, I was anticipating another evening like the last two, but the contractions only got stronger and longer. We were already scheduled for an induction at 6 a.m., so we headed to the hospital, taking bets on how far dilated I had become. I got an epidural about an hour after arriving at the hospital, and within another hour and a half, I was already pushing. I was super blessed to only have to do 40 minutes of actual pushing – feeling very little pain or pressure. In fact, once Doc came in to deliver Wes, I only had 2 major pushes. He decided to arrive with a bang, and I remember seeing an entire body escape at what seemed like 20 mph – leaving all the nurses dumbfounded at how fast he came into this world. Wesley Matthew was born at 10:39 a.m. on July 18, 2011. 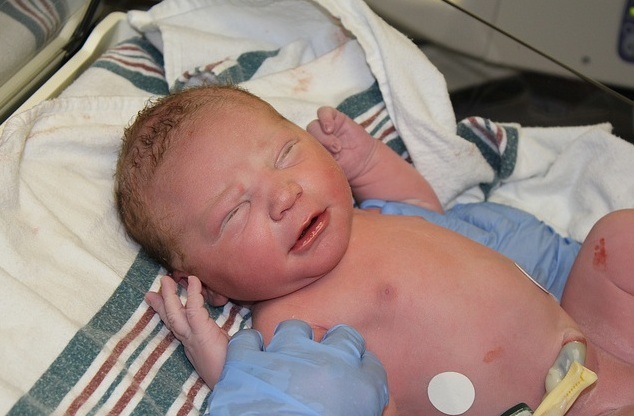 He weighed 8 lbs, 0.4 oz and was 20″. He looks a little like me, but is a healthy mixture of both of our mothers’ sides of their families. He’s got a cute little old man scowl, which I’ve affectionately nicknamed GrumpFace. 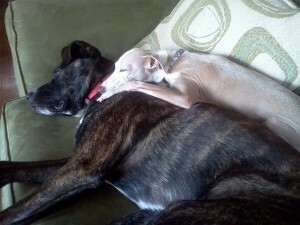 Jake and Lucy have been rock star dog-sibilings! I was overly anxious about how they would react to him, but as Steven usually says, I was being unreasonable. They were anticipating something great was about to happen, and their welcoming licks and kisses just about made my heart melt. Wesley is part of the pack. Jake has already claimed his legs & feet for lounging upon, and he repeatedly shares my lap with Wes as he’s feeding. Lucy lays down next to him during tummy time. She loves to watch him through the rungs of the bassinet while he’s sleeping. And there is no lack of doggie kisses! They both give his feet some lovin’ whenever they get a chance. The next step is attempting a walk with the entire family. This has yet to be accomplished since it’s been so freakishly hot and humid. Once it gets below 95 degrees, perhaps we’ll be able to make use of our awesome jogging stroller! I gave birth to a champ. He’s super strong, a great eater and has allowed us to sleep 4-5 consecutive hours for 3 nights in a row. (Fingers crossed it stays this way!) I’m increasingly amazed at how natural it is to care for a little human. I may not be doing everything I should be doing, but he doesn’t know any better and probably doesn’t even care. Obviously he’s content – proven by the fact that he has a slight smirk on his sleeping face at the moment. The visits with friends and family have been great. Everyone loves this little guy! We have some wonderful people in our lives. I’ve definitely felt the affects of all the prayers given to us. Our week has been nothing but fun and special. We are blessed! 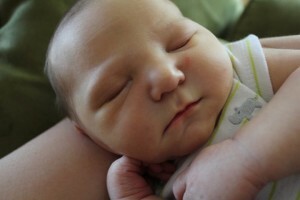 If you’d like to see more photos of Wes, his big first day and beyond, visit Steven’s flickr. I’m sure we’ll be updating it frequently as he grows and changes. We have a son! I know you’re officially only 2 days “late,” and it must be nice and warm, comfortable and entertaining with all the gurgles and whooshing sounds surrounding you. I promise, however, it’s very nice out here in the world, and your father and I are so looking forward to introducing you all kinds of new discoveries out here. Admittedly, I’m a little cranky this morning because I didn’t sleep well. It’s not your fault, I know, but mild, intermittent contractions for 12 hours last night got me excited that you were on your way. When they stopped suddenly this morning, I was disappointed that I would have to wait longer to see you and hold your tiny little hands. We may have to wait until Monday to look upon your face, but I thought I’d give you once last little nudge to see if today or Sunday might be a possibility. Think about it, but don’t force yourself into something that will harm you. You are loved tremendously already; I can only imagine how that love will grow when we finally have the chance to snuggle, laugh and grow with you! I woke up this morning thinking my water had broken overnight. You know, this is the first time I’ve ever been pregnant, so I really didn’t know what to expect. Since today is the official due date, I had an appointment scheduled in the late afternoon anyway, but my doc wanted to see me earlier to check out if the sac had indeed broken. FALSE ALARM. Who knows what it was – perhaps Wes’ head is just sitting on my bladder too well, or maybe I was really hot? Gross. Either way, no baby on D Day. However, the good news is that I’m now 4 cm dilated and 80% effaced. Wes has dropped considerably lower at -1, so all that galloping around the house yesterday must have done its work! Doc says I should deliver this baby at any time! Wahoo! He said he’d be surprised if I was still pregnant come Monday. After all my hesitations about preterm, convenient “elective” inductions, I don’t feel so badly about having an induction scheduled for Monday morning if Wesley doesn’t arrive before then. It eases my mind that Doc feels confident I’ll labor fairly soon, and since I’ll be postterm on Monday, an induction doesn’t scare me as much. If Monday rolls around and I’m still pregnant, at least I tried to deliver on my own. I’m not giving up hope just yet. When my mom was pregnant with my older sister, her water broke just after sharing a dozen donuts and a pot of coffee with my dad. We stopped at Hart Bakery on the way home from my appointment, and I’m now enjoying my 3rd donut and second cup of coffee of the day. No shame. Heartbeat, Measurements, Blood Pressure: Mine was up to the 140s today because of sheer nervousness! Weight Gain: Lost a pound! Cravings: Fruit smoothies. We’ve been making quite a few with our new Ninja food processor. Moods: Yesterday I was totally bummed there wasn’t a baby in my arms. Today I’m excited that there might be a baby in my arms within a few days. Biggest Gripe: Water didn’t break. I have to admit I just probably had, well, an accident. Biggest Like: Excitement is growing around us. Everyone is thrilled to meet Wesley! You know how they say all brides have their breakdown day? Mine didn’t come until I was actually walking down the isle with my father. (Ask anyone who came to the wedding – they couldn’t even look at me without tearing up!) 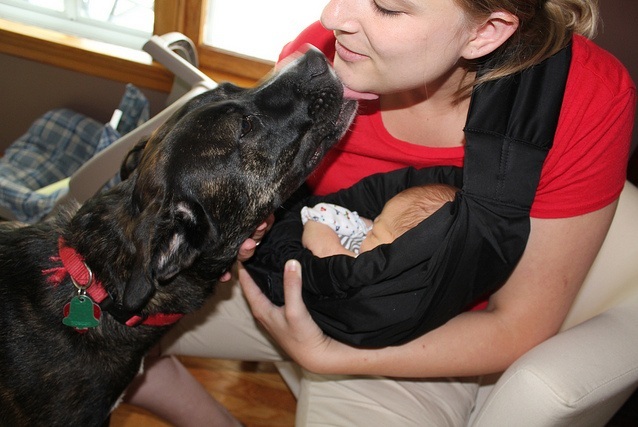 They don’t talk about breakdowns much for new moms. Hormones, postpartum blues, yes, but I’ve seen very little in pregnancy books on days when nothing seems to go correctly and you enter an exaggerated, ridiculous state-of-mind. I’m actually glad I allowed myself to reach this point prior to being in the hospital, but let’s just say I’ve seen better days. The morning was actually pretty good. It was my first day working from home. I made a fruit smoothie and felt very proud of myself. I reply to emails in pjs. I took a shower – washed my hair, even – and got dressed as I would any other day. After doing as much as I could for work, I cleaned for a couple hours and allowed myself a nap. At this point, it was a good day. I went to my follow up appointment this afternoon, which is where the trouble started. Remember my last post? I had made up my mind that I wasn’t going ahead with the “convenience induction.” I wrote it out to secure my decision. Well, after meeting with my doc today, the option was brought to the surface again. I have a killer Bishop score of 9, which says that things are progressing well enough that if induced on Wednesday, I would likely labor normally and have a baby by the end of the day. I honestly wouldn’t even consider doing this if not for the fact that my doc is ONLY on call this Wednesday during this week and won’t be again until NEXT Wednesday. I am so torn: I feel like this is just a morality decision at this point. Meaning, Wesley comes under my terms, not my body’s or God’s… all for the sake of delivery with the doctor that I’ve known and trusted for these long months. Enter: hormonal breakdown. I’m on the schedule for 6am, Wednesday, July 13, 2011, for an induction. I have until morning to decide if I want to cancel. I hate that I can’t have it both ways. I would love for my doc to deliver Wesley, but the chances of that happening if I labor normally are slim. Steven says it’s up to me, and that this decision is likely to be the easiest and most trivial one in all of Wesley’s life; however, he agrees with me on the hesitation for an induction based solely on convenience. So, here we are. I’ve run out of tissues, and toliet paper is just gross and gets soggy too fast. I’m over being irrationally nervous about this decision, and I don’t want to waste the rest of my evening biting my nails. Likely I will call and cancel in the morning, but I do have the next several hours to really think about this. Perhaps Tuesday will be the Day Of Self-Induction Techniques and old wives’ tales so that my doc can deliver this baby! Wow. Hard to believe that he could be here at any time. I’m currently blogging during my second-to-last lunch break at work. Come Monday, I’ll be working from home until Little Guy decides to show up. It really has passed quickly. I have little to complain about, though I still do complain at times, and I admit when I’m in a grouchy mood. I’ve had ZERO stretch marks, no nausea, my nose hasn’t gotten wider (thank goodness), and I’ve lost my love handles. Wesley is a big boy, but he’s decided to stretch out all in front of me, so I hardly look pregnant from behind – that is, if I’m not waddle-walking. I’d call this pregnancy a success. I saw Jody this morning, and things are progressing normally. In fact, they offered me an induction date of July 13 if I’d like to take it. My cervix is very favorable at this point, and they truly think I’d labor well if given an induction. After talking to my husband, my mom and mother-in-law, I think I will pass. I’ve heard scary stories about long labors leading to c-sections because the body just wasn’t quite ready for birth. Since I’m already under way, I’m preparing myself to just let my body do its thing. Yes, it could be a week longer than anticipated, but I think it’s for the best for me. Whew. I’m glad I wrote that down. Sealed the deal. I go back to the doc on Monday to see if anything changes over the weekend. Here goes nothing! Heartbeat, Measurements, Blood Pressure: A-OK. Weight Gain: Another pound, for Pete’s sake. That makes total weight gain close to 40 whopping pounds. Movement: Less room for him this week, but he’s still moving. In fact, he moved his rear end completely to the other side of my uterus last night. How is that even possible? I swear he’s 23-25″ long for how much space he takes up! Dilation: 3 cm, 75% effaced! Moving right along. Cravings: Fruit popsicle bars. Especially strawberry with the little seeds. Moods: Surreal, pensive and in awe of this whole process. God truly designed a very special body that can handle amazing things. Biggest Gripe: Sleep is getting harder, and I’m sweating more. And don’t forget those dang swollen feet. Biggest Like: Excitement and anticipation is much better than I expected. 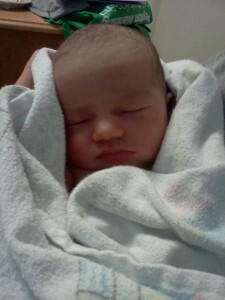 I really thought I would be panicky up until this point, but the birth of Beatrice has helped better align my thoughts. I see John & Julia become parents overnight, and they are doing wonderfully. Still so, so thankful that we have close friends who live just around the corner going through the same life changes. They are truly in love with their little Bebe, and it makes me excited to finally meet our son. OUR SON. Wow. Apparently I’m not the only one in the house who is ready for pregnancy to be over. Jake is highly irritated with my lack of lap to sit in, and as it happens now, he is forced to sit halfway on the arm of the chair and my bulging belly. I’m anxious to see how the dogs react and interact with Wes. My guess is that Jake will be interested for a couple days and then go back to sleep again. Lucy will be scared of the newness of him at first, but the two will soon be buds until the bitter end. And this I know for sure: we’re going to constantly battle sharing of Wes’ toys. All these rattles, plush animals and squeakers are pretty much dog-confusing. To take my mind off my last handful of days as a walrus with a tiny bladder, our close friends, the Reynolds, brought little Beatrice into the world! Julia and I have been going through our first pregnancies together, just 3 weeks apart. Her birth experience was pleasant, which has definitely eased my mind and nervousness about labor & delivery. But most important, what does it matter when you see this precious little person? I can’t wait for this summer; we will be having some marvelous days with W&B. Looking forward to a fun day spent celebrating our freedoms in this country and the people who served to bring about these freedoms. My Indian “aunt & uncle,” David & Sheela, will be in town and celebrating with us. They are spending several months in the states, attending conferences and speaking to churches about their mission in India. I have had the unique pleasure of knowing them as part of my family for nearly 2 decades and have grown incredibly close to their kids as a result. Shiny is one of my dearest friends, and I’m so happy to see her and her own new little family today. It’s times like these that I realize how blessed I am. What’s a few more weeks of swollen ankles, constant bathroom trips, restless sleep and overall uncomfortableness? The light is at the end of the tunnel, it’s shining bright and I can’t wait to see what’s on the other side. God is good.